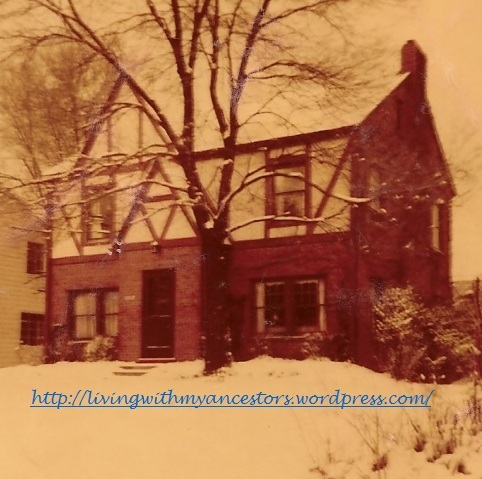 Around 1956 my family moved to a little town called Van Wert, Ohio. 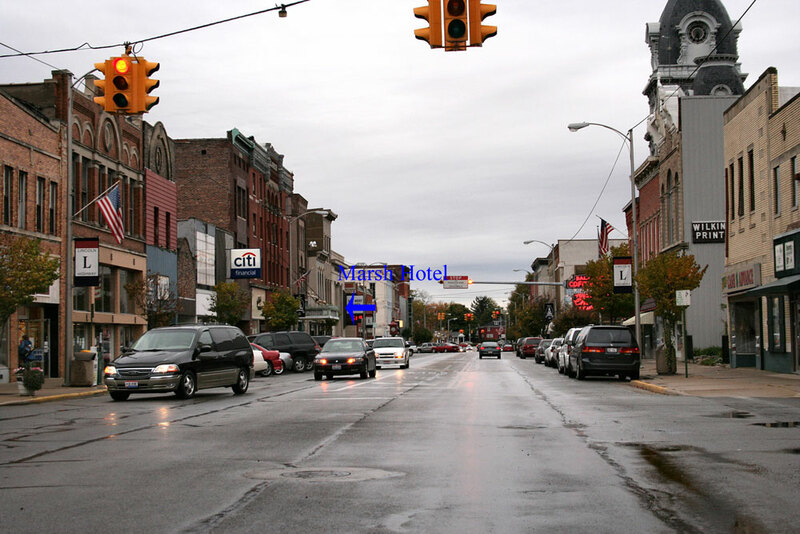 Apparently Dad took it upon himself to buy an old hotel smack dab in the middle of town. 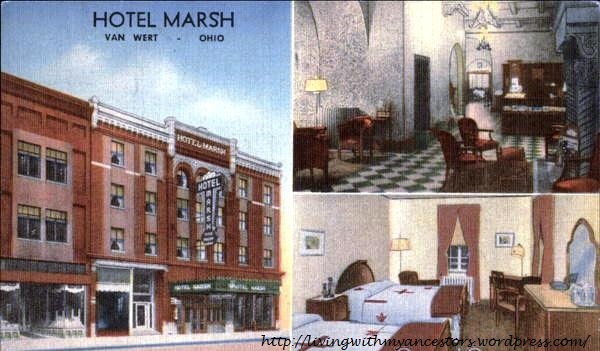 It was called the Marsh Hotel or the Hotel Marsh, depending upon individual preference. This became my new stomping ground. We occupied the Manager’s Suite on the top floor. But what–you say–did a kid do in the middle of downtown for entertainment? Well, there were lots of things to occupy my days and my mind. For starters, there’s the Hotel itself. How many kids get the run of the house, especially if that “house” is a hotel? Being Nancy Drew incarnate, I could run up and down those hallways and into empty rooms looking for “clues” and building cases. There was a big formal restaurant dining room in the back of the Hotel. In that dining area sat an old piano. Gosh, I loved that old piano. I didn’t know how to play but that didn’t stop me. I learned all the easy stuff kids learn on pianos without lessons. Twinkle, Twinkle, Little Star; Row, Row, Row Your Boat; you get the idea. Little tunes kids can pick out on their own. Of course, that was only allowed during times the restaurant was closed. We wouldn’t want to ruin anyone’s appetite! The check-in desk was full of surprises with its cubbyholes and glass display cabinet. There were boxes of cigars in the display that were for sale. I don’t like the smell of cigar smoke but I did like the smell of those cigar boxes! I had quite a collection of the old empty boxes. Most were used to store my crayons and other trinkets. 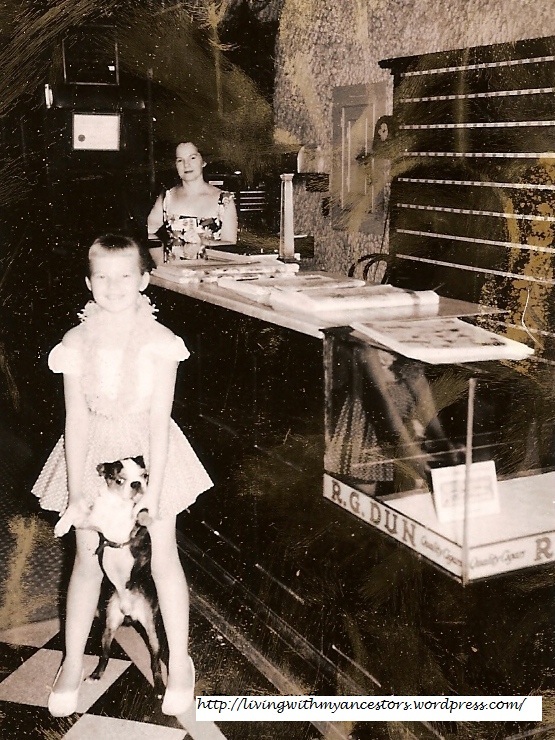 Yep, that’s me, my Mom and my faithful companion, Happy, right there at the check-in desk. It’s a pretty beat-up picture but if you look real close over my Mom’s right shoulder, you can just barely make out an old PBX switchboard. I’m guessing it was installed maybe in the 1930s or 1940s. 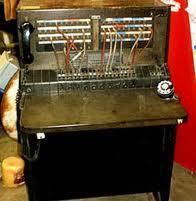 This picture is just an example of the PBX with those cords and buttons and I knew how to use it. I was able to take and place calls on occasion to help out! It was fun. 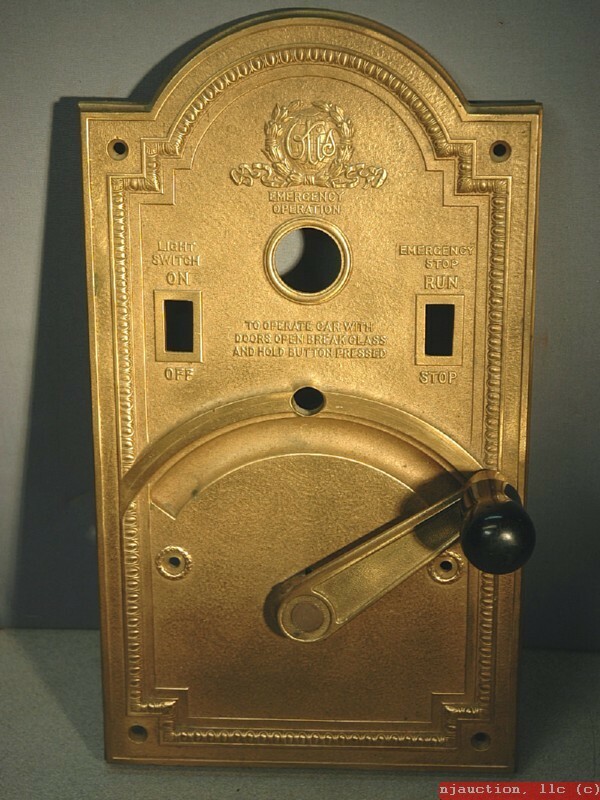 The hotel was four stories and had an old Otis elevator that was manually operated. It had one of those gates across the door that was shut manually. And then there was the apparatus that moved the elevator up and down. It was pushed to the right to go up and left to go down. The trick was when you stopped at each floor you had to bob up and down until you got it lined up. Otherwise, there would have been a big step up or down when exiting the elevator. I did operate the elevator on occasion. There were times when I just wanted to go upstairs and grab something out of the apartment without having to run up and down the flights of stairs so I would take the elevator. Sometimes I would even get to take the guests to their floor. Then you always said “Watch your step, please.” Of course, I only got to do that when Shorty was busy! We had a regular bellhop named Shorty who was also the elevator operator. Such a nice man he was, too. Heck, he tolerated me, didn’t he?! Hey, I just realized. Could this be like a forerunner to video games? You don’t see the connection? Well, I had to synchronize the handle up and down to get it lined up just right with the landing. There were definitely some perks being the young daughter of the Hotel owner. Every now and again someone famous or sort of famous would stay at the Hotel. One such individual I remember so well was Duncan Renaldo. Who is that some of you younger readers might be asking. Why, it’s the Cisco Kid! Oh, Pancho! Oh, Cisco! 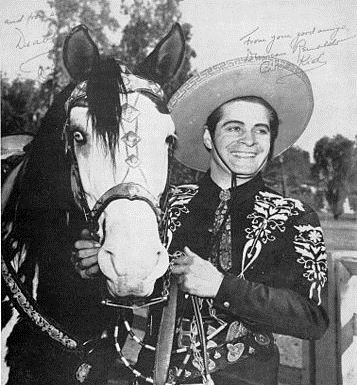 Leo Carrillo, who played Pancho in the TV series was traveling with him. Of course, he also brought with him his trusted horse, Diablo, but Diablo, much to my chagrin, did not stay at the Hotel. They were in town for the Van Wert County Fair. Even as a child, I knew that the Cisco Kid was a VERY handsome man! He and Pancho were talking with me and asking me if I watched their TV show. Of course I told them I did – and I did. When they asked me which day it was on TV, I couldn’t tell them. I was so embarrassed at the time. But, he was so gracious. He had such a wonderful laugh and he said I was so cute. Well, that was all I needed. I was smitten. Of course, my poor mother was just sure that I would be “discovered” and asked to go to Hollywood and become famous and rich. Ha! 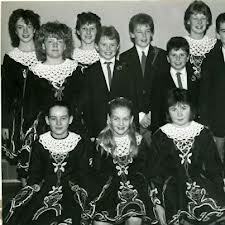 One other example was a troupe of Irish dancers touring the country. If memory serves, they probably ranged in age from about 10 or 12 to about 15 or 16. Having Irish blood myself flowing through my veins, I felt as one with them! They were teaching me how to do the Irish jig and a sword dance. My, but they were a fun bunch. I was able to ride on the tour bus with them to one of their stage performances. Naturally, I fell in love with a couple of the Irish boys. They weren’t just cute – they had the neatest accents ever! They paved the way for Michael Flatley and Lord of the Dance!! Yes, there was a lot of mischief for a young girl to get into at that old Hotel. In Part 2 I’ll move my activities to the great outdoors. Look out world, here I come! Jeremiah Burns is of Scottish origin. His grandfather, Patrick Burns (son of John Burness), migrated from Scotland and settled in Maryland. His father, James Patrick Burns, later migrated to Virginia and settled in that part of Luenberg County (formed from Brunswick in 1746), which became Bedford County in 1753. 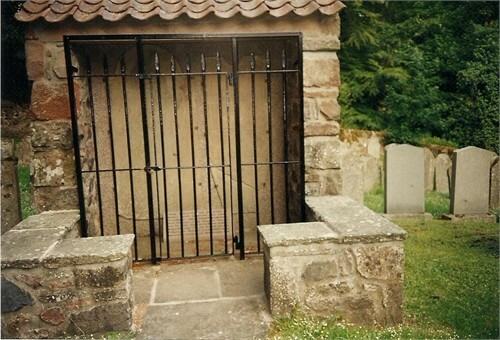 The name and family history of Burness are found on old tombstones in the churchyard of Glenbervie, Scotland. It is noted by “several historians” that Jeremiah was of the same line of descent as the illustrious poet, Robert Burns. Jeremiah was born October 26, 1752 in Bedford County, Virginia. He received his education in Bedford County and at an early age studied for the Methodist ministry. He married his first wife in Virginia by whom he had two sons (names are still unknown at this time), but it is said that when they were grown they went to the southwest and became noted people. In June 1776 Jeremiah enlisted in the Virginia line of the American Revolution at Bedford County, Virginia for a period of three years as a private in Captain George Lambert’s Company commanded by Colonel George Matthews under Major General Nathanael Greene, it being the 14th Virginia Regiment, afterwards consolidated into the 7th; he continued to serve in said Corps, or in the service of the United States, against the common enemy until the expiration of his enlistment, during which time he served in the battle of Germantown, Pennsylvania, October 5, 1777; and the battle of Monmouth, New Jersey, June 28, 1778, where Washington harassed the British at Monmouth Courthouse. Without taking a discharge or bounty land he enlisted for another three years and continued with the army under Major General Greene. 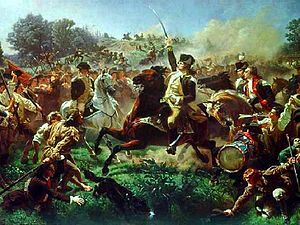 In 1781 he was marched to Yorktown, Virginia and served in the Seige of Yorktown which began October 6, 1781, which battle was the turning point in the war when British General Cornwallis surrendered on October 19, 1781 to Washington. In August 1782, after serving six years, he was honorably discharged at Williamsburg, Virginia by Colonel Ross. Jeremiah was a farmer and a noted Methodist preacher of his day. It is unknown just when his first wife died, but while preaching at a Methodist Church in Franklin County (created from Bedford and Henry in 1785), he spied in his congregation Elizabeth Rowland, born Franklin County, Virginia, June 11, 1770, who was a beautiful girl and a devout worshipper as well as being gifted with a melodious voice. An historian stated of her that in song she was wonderfully gifted; a brunette of the most perfect type; hair as black as a raven, heavy eyebrows, a curved lip, and a faultless figure. The preacher fell in love with her. She accepted his hand and heart and they became one flesh. After a short courtship he and Elizabeth were married on March 20, 1794 in Franklin County, Virginia by John Watt, a Methodist Minister. Jeremiah and Elizabeth were the founders of the Burns House in the Big Sandy Valley (Eastern and Southeastern Kentucky). Jeremiah and Elizabeth had nine children, who honored their parents by rising to distinction in law, theology, and official stations. They are: Roland Tiernan Burns, Jeremiah Burns, Jr., Nancy Reed Burns, Jane H. Burns, Amanda Burns (my direct), John Lewis Burns, Charles C. Burns, James P. Burns and Julia Anne Burns. I have additional information for anyone interested. Elizabeth was descended from a family made famous in French Huguenot history. Until Jeremiah’s alliance with Elizabeth, a French beauty of the perfect brunette caste, were all blondes, but the blood of the Huguenots has changed the type of the family to a full brunette. (From the book, The Big Sandy Valley by William Ely.) As a side note, here’s a little history of the Huguenots. The Huguenots (click here for additional information) were French Protestants, most of whom eventually came to follow the teachings of John Calvin, and who, due to religious persecution, were forced to flee France to other countries in the sixteenth and seventeenth centuries. Some remained, practicing their Faith in secret. . . . Since the Huguenots of France were in large part artisans, craftsmen, and professional people, they were usually well-received in the countries to which they fled for refuge when religious discrimination or overt persecution caused them to leave France. Most of them went initially to Germany, the Netherlands, and England, although some found their way eventually to places as remote as South Africa. Considerable numbers of Huguenots migrated to British North America, especially to the Carolinas, Virginia, Pennsylvania, and New York. Their character and talents in the arts, sciences, and industry were such that they are generally felt to have been a substantial loss to the French society from which they had been forced to withdraw, and a corresponding gain to the communities and nations into which they settled. In the name of God, Amen. I, Jeremiah Burns, of Lawrence County and State of Kentucky, being of sound mind and judgment, but knowing that it is appointed for all men to die, do make and ordain this my last will and testament in manner and form following. I recommend my soul to Almighty God, the dispenser of all things, and my body to be buried in a decent and Christian manner at the discretion of my surviving friends hereafter mentioned. And as to my worldly goods that it has pleased Almighty God to Bless me with, after my funeral expenses are paid, I dispose of in the following manner, to wit: I give and bequeath to my wife Elizabeth Burns the place that I now live on for which I hold a title bond on David L. Ward for one hundred acres of land, being part of William Grayson’s 70,000 acre survey. Also two horse beasts, one mare named Canary and one two year old filly named Phoenix, also the cow beasts, which consist of three cows, a three year old steer, a three year old bull, and a two year old heifer; also two young calves, and ten head of sheep. Also fifteen head of hogs and twelve geese, and poultry of every description. The household furniture consisting of three beds with their covering, cooking utensils, with the table and furniture, the loom with its tackle, one shovel plough and one set of drawing gears, two axes, three hoes, with all the farming utensils. The Bible hymn book, the letter writer and Scot’s lessons, also two spinning wheels, one little wheel and one big wheel, and two large sugar kettles, two augers and drawing knife, and if there should be any part of my pension that should be in arrear that is to be for her use. And the balance of my books I give and bequeath to my son Rowland Burns which consists of the first Vol. of Blair’s sermons, the fourth Vol. Wesley’s sermons, Milton’s works, Paradise Lost. I also give and bequeath to my son John L. Burns one horse beast called Nudly, and a rifle gun, but he is not at liberty to dispose of them until he comes of age. And the within named property granted to my wife Elizabeth Burns, is to be hers her lifetime to dispose of as she thinks best if she remains a widow. But if she should marry she is only to have her third and balance of the estate is to be equally divided amongst my children, to wit: Rowland Burns, Jeremiah Burns, Nancy Githens, late Nancy Burns, Jane Rice, late Jane Burns, Amanda Burns, John L. Burns, Charles C. Burns, James P. Burns and Juliann Burns; and if she remains a widow at her decease whatever remains of the estate to be equally divided among the above named Rowland Burns, Jeremiah Burns, Nancy Githens, late Nancy Burns, Jane Rice, late Jane Burns, Amanda Burns, John L. Burns, Charles C. Burns, James P. Burns and Juliann Burns. Lastly I constitute my son Rowland Burns and son-in-law John Githens executor of this my last will and testament, ratifying it to be such. Elizabeth died at Louisa, Lawrence County, Kentucky, on April 27, 1859, age 89, and was buried in Widow’s Graveyard. It truly is a beautiful morning. The sun is streaming through my window, the air is crisp with a very slight breeze and the temperature is 63 degrees F. I’m just kicking back listening to the chirping of the birds in the neighborhood. It sounds so sweet. It smells so clean. It’s the perfect combination that’s making childhood feelings and memories spring to life. I’m transported to another place and time. Has it really been so long since I noticed? Just listen to those birds. 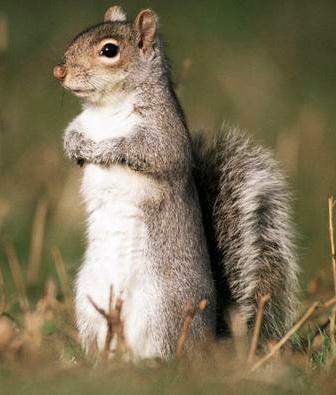 And the squirrels chattering. 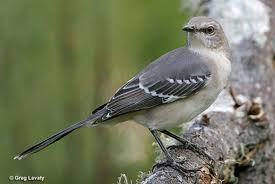 It’s not just chirping, it’s music. Ah, early morning. Time to get up and go out to play! 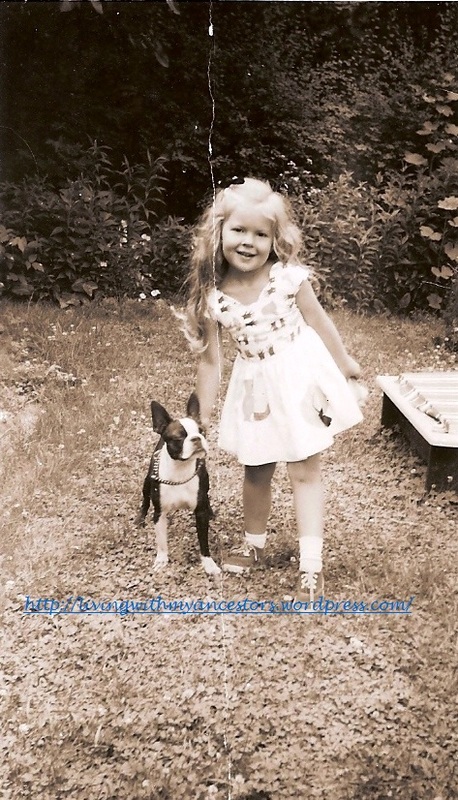 Here I am with Happy, my best friend and faithful companion of ten years in the backyard of my childhood home. Great memories of that backyard. That’s where my mother would sunbathe on her quilt while teaching me the alphabet and to count to 100. My mother kept a beautiful flower and rose garden. She had every color rose and I can still smell that beautiful strong rose scent. I don’t know all the different kinds of flowers she had. But I remember the beauty. I’m just sad that I have no pictures of her garden. Dad had a big strawberry patch. I remember he built a frame with chicken wire to set over the patch. 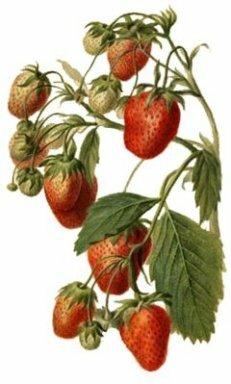 He said it was it was to keep the birds from eating the strawberries and to keep a little girls hands out of the patch. Hmmm. I suppose he meant me but it didn’t work! It’s amazing what tiny little fingers can reach through. I can remember a time I was in the kitchen with my Mom. She was standing at the sink cleaning and preparing fresh-picked strawberries for dinner. She had me seated on the kitchen counter next to her. As she cleaned each strawberry and I ate it, I told her, “Mom, you’re the best cook!” I guess she liked that because I can still hear her laughter after all these years. I’m sure my Dad and my brother would have different memories of the back yard. Since it backed up to the wall of the Upper Arlington High School football stadium, they were always having to clean up the back yard and the garage roof following every activity held in the stadium! The only picture I have of my childhood home was taken in the winter. I’m posting it here even though it doesn’t fit with my spring theme! What an influence this house has had on me and my taste. I adore English Tudor. If I could have this house in a warm climate, I’d jump in a heartbeat!! I always wanted to be a detective. Like practically every other young girl my age, I had a steady diet of Nancy Drew books. But I was convinced I was Nancy Drew. It wasn’t that difficult to pretend I was a detective growing up like an only child in my Dad’s old hotel. There were definitely plenty of nooks and crannies to explore and look for clues. Then when I was older, I worked with the local police department. I loved it. I was a fully sworn police officer for a year. I should have stayed with it and I might have actually become a detective. But I passed up the opportunity and opportunity never reared its head again in that regard. But I have always loved following clues and solving puzzles. So, guess what works in its own way. Genealogy! Those who are into genealogy know exactly what I mean. After all, how much harder can it be than trying to solve old cold cases! And sometimes I really get lucky and find living relatives. That’s just what happened recently. A little background for you, dear reader. My mother comes from a family of ten children. Some stories I’ve heard would seem to indicate that they were a close-knit family. Other clues point in different directions. It seems to me that her siblings all pretty much went in different directions and didn’t appear to have much contact. Out of nine aunts and uncles I have eleven cousins. Over the years I have managed to re-establish email contact with four of them but we have yet to see one another since the 70’s. But at least I knew them growing up even if we weren’t together as much as I would have liked. Mother’s youngest brother had two daughters, Linda and Susan. Susan is my age and Linda is a few years older. I never met these cousins. They are not included in the four referred to above. I know my mother cared for her younger brother because of things I heard her say but no one in her family ever seemed to want to go out of their way to get together. As a child it didn’t bother me because I didn’t know any better. Now, it bothers me. I’ve thought about my missing cousins off and on over time. Working on my genealogy has really brought it to my attention. So why couldn’t I try to find them? 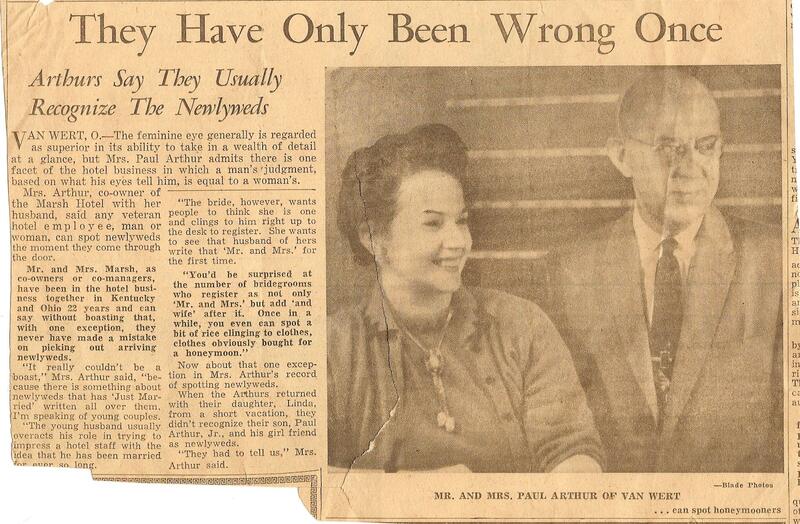 The initial bump in the road, after 60+ years, how on earth could I find out their married names? Assuming, that is, they did marry. I set the thought aside for the time being but it never really went away. Recently I began sorting through old papers and documents that I had accumulated years ago when I first began researching my genealogy. My, my! What’s this? Look! It’s an obituary for my uncle. And, what’s this? Gasp! Right there in black and white are his daughters’ married names. Oh, but there’s no location given. Who knows where on earth they might be living now? Who could I ask? All my aunts and uncles are deceased. I asked the cousins I had contact with for any clues. They knew nothing. This can’t be. To myself: “Think, Linda, think. When you first started your genealogy everything was done either first-hand or through the mail. Then in the late 90’s you were able to glean information from some of the genealogy websites and forums. Now? Well, it seems that now the sky is the limit.” My goodness, is there nothing that can’t be found on the Internet? I think not. And what does the Internet have now that it didn’t have then? For one thing, FACEBOOK! Aaack! Facebook? Seriously? Well, what have I got to lose? It’s true I’m not a big fan of Facebook although I do have a page. And, yes, I will occasionally go on there to see what other family and friends who actually use it are up to. Well? Who is to say my cousins aren’t on there. Just go look. Nothing ventured, nothing gained, etc. etc., and all those other clichés. It just might work. Hmmm, but look at all the hits for both Susan and Linda. So what? Check them out. See if you can find any connections. Oh, look, I can access their “Friends” list. Oh, oh, oh. Look, Susan has a connection with a matching Linda. Fever pitch. Is it possible it’s going to be that easy? Okay, I’ve got what appears to be matching names. Oh, this can’t be right. This has both individuals living in Florida. Gasp. They both show connections to Virginia. Aha! Another clue. Phone number, phone number, I need at least one phone number. Gotcha! Susan and I talked for at least half an hour, which was quite a while for her since she was under the weather. She gave me Linda’s telephone number and I contacted her. Linda and I talked for almost an hour. It truly is a small world. Linda and Sue live less than two hours from me. Once Sue was well, we planned a meet and greet. Last week we met for the very first time. 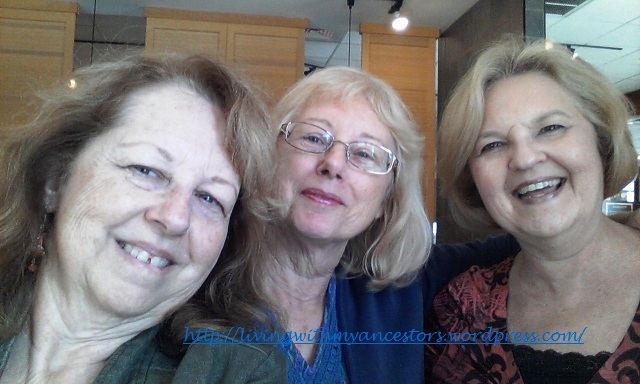 We spent nearly four hours just talking and sharing genealogy and trying to catch up. I’m surprised the restaurant didn’t throw us out but I’m glad they didn’t! This has been an exciting event for me. I have two new best friends! We’re going to be getting together at least monthly. The suggestion has already been made to try and put together a family reunion. Pessimist that I am when it comes to extended family, I don’t really see that coming to fruition. But I won’t completely rule anything out. So, in conclusion, I wish all other amateur genealogists out there the best of luck. And don’t give up! Keep following clues and when the trail runs cold, take a break and pick it up again later. I’m certainly glad I did! “We are all connected; to each other, biologically. To the earth, chemically. There is something about being connected to the Earth. There really is an energy. I’ve never been a barefoot kind of girl growing up. I remember the times I would go barefoot as a child, my feet were either too sensitive or I was always stubbing my toe. But there is just something magical about wiggling your toes in the hot sand (as long as it’s not too hot!) or standing where the sand is wet with ocean waves and feeling the sand squish between my toes. Or lying down in the grass and watching the clouds pass by overhead (before fire ants). Next time you have a chance to connect with the Earth, gauge your feelings before and after. The surface of the Earth resonates with natural, subtle energies. In his essay titled “Nature”, Ralph Waldo Emerson lays out a problem that he attempts to solve throughout the essay: that humans do not fully accept nature’s beauty and all that it has to offer. According to Emerson, people are distracted by the world around them; nature gives back to humans, but humans don’t reciprocate the favor. Sound familiar? It sure does to me. In this crazy mixed up world of today, it seems that so many people are expressing their desire to get back to nature but not following through on that desire. Clearly, a person must allow nature to “take him away.” Nature and humans must create a reciprocal relationship, “Nature, in its ministry to man, is only the material, but is also the process and the result. All the parts incessantly work into each other’s hands for the profit of man. The wind sows the seed; the sun evaporates the sea; the wind blows the vapor to the field; the ice, on the other side of the planet, condenses rain on this; the rain feeds the plant; the plant feeds the animal. . .”, etc. Nature and humans need each other to be beneficial. There is ongoing scientific research as to why people feel better when they connect with nature. Studies have shown that since the late 20th century, chronic degenerative diseases have overcome infectious disease as the major causes of death in the 21st century. So science is looking for an intervention that inhibits the development of these diseases and slows their progress. Could such an intervention be located right beneath our feet? Earthing research, observations, and related theories raise an intriguing possibility about the Earth’s surface electrons as an untapped health resource—the Earth as a “global treatment table.” Emerging evidence shows that contact with the Earth may be a simple, natural, and yet profoundly effective environmental strategy against chronic stress, inflammation, pain, poor sleep, and many common health disorders, including cardiovascular disease. The research done to date supports the concept that grounding or Earthing the human body may be an essential element in the health equation along with sunshine, clean air and water, nutritious food, and physical activity. There are so many ways to commune with nature. My parents used to like to vacation by spending in Florida on the beach in the early 50’s. Sixty years later, I find myself enjoying the same thing. The sand, the surf, the wind, the sun during the day and the stars and moon at night. My battery is running down. I feel it’s past time to go out there and rejuvenate myself!